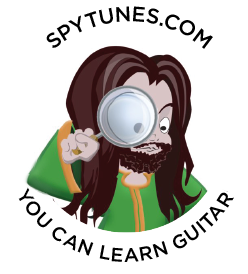 The intermediate course teaches you not just acoustic songs but how to actually crack the fretboard code. This is achieved by studying barre chords and pentatonic scales, together they will outline the fretboard and make sense of how music actually works on the guitar. As well as learning this you also practice chromatic and sweeping exercises, as well as strumming exercises. The exercises for doing all this can be previewed by following the links to each topic below. Once you learned all the chords in a key, you need to look at all the possible variations to these chords. Pretty much every big hit song written uses predictable chord progressions in one key, in combination with one or two variations. Understand these variations and you will unlock the secret to songwriting and improvisation. Go to intermediate chord progression to find out more. Can you completely visualise every chord and scale on the fretboard? Chordacus can and if you use it enough, so will you! 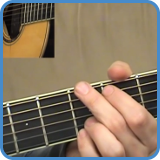 This chord and scale finder software will show you all barre chords and pentatonic scales in every shape and key. 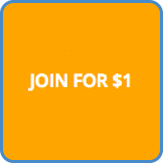 Go to the intermediate chordacus page to find out more about how this software can help you. On this page, you learn how to turn all your open position chords into barre chords. The biggest misunderstanding when it comes to barre chords is that you have to play the full shape, you don’t. 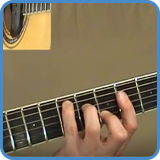 In the intermediate course, we play fractions of these big barre chord shapes. However, it is important to first see the full shape. Visit the page intermediate chords to start this journey. You’ll find both sweeping and speed variations of the chromatic exercise on this page. In total, there are ten new variations to practice, all of them will improve your coordination, timing and speed. In the intermediate course, we develop these exercises in all sorts of ways to improve your accuracy. This will, in turn, enable you to play really fast. To see all video lessons, visit intermediate chromatic exercises. After you transformed all the open position chords into barre chords you have to connect them all over the fretboard. These video lessons show you exactly how to do this in five keys. When you completed these exercises you will have mapped out the fretboard. These exercises are really important, the same approach is applied to scales and later on, the arpeggios as well. 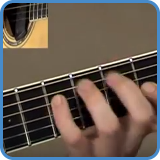 Visit connect chords to view the video lessons. These exercises will teach you how to read rhythm, simply follow the video lessons instructions and play along. When you take the step by step intermediate course, you’ll learn how to develop these into more complex exercises as well. 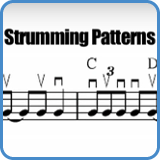 Try them out today by visiting the intermediate rhythmical exercises page. There are two main scales to learn at this stage, the Minor Pentatonic and the Major Pentatonic. These scales are built from the barre chord shapes and lay the foundation for every other scale you need to learn in order to master the guitar. 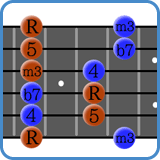 As well as theses pentatonic scales, you also find links to the Blues and Conspirian scales. Go to intermediate scales to find out more. 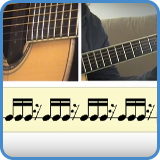 In the beginner course, you learned how to see a chord progression as numbers using the SWS. When you take the intermediate course, we add all the pentatonic scales to this equation as we learn how each barre chord has its own pentatonic shape. 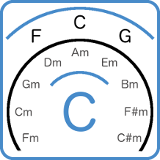 Go to intermediate songwriters swivel to find out how this tool can help you understand music and the guitar fretboard.